As strange as it may seem Arthur Conan Doyle, the creator of the ultra-rational detective, Sherlock Holmes, was a believer in Spiritualism. 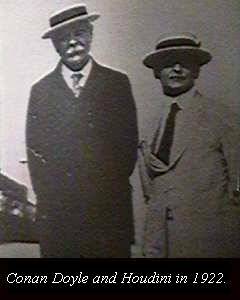 He came to his belief, that one could communicate with the dead, after his son was killed in World War I. Conan Doyle became an expert in the field and even wrote a two volume History of Spiritualism in 1926. Harry Houdini, perhaps America's foremost magician in those years, was a friend of Conan Doyle's, but was skeptical of Spiritualism. Houdini took every opportunity to use his understanding of magical illusion to expose mediums and psychics he thought were fakes. He was particularly incensed by those who took advantage of grieving relatives to make a profit. Because of this difference Conan Doyle's and Houdini's friendship was not always an easy one. For this reason Conan Doyle, who had come to the states in 1922 to give a series of lectures on Spiritualism, regarded with suspicion an invitation by Houdini to attend the annual meeting of the Society of American Magicians. Conan Doyle was fearful that Houdini, and the other magicians attending, would take the opportunity to ridicule his spiritualistic beliefs. Abruptly, though, Conan Doyle changed his mind, having come up with his own "trick" for the meeting. The gathering was held at the Hotel McAlpin. Each magician demonstrated his best tricks trying to outdo the others. Finally, at the end of the meeting, Conan Doyle mounted the stage. A movie projector and screen were brought into the room without explanation. Many of the people at the meeting knew of Conan Doyle's beliefs and were aware that he owned a collection of "psychic photographs" (pictures supposedly showing ghosts, fairys, etc.) and may have connected them with Conan Doyle's comments and the motion picture equipment. Conan Doyle started by telling the audience that he would answer no questions about the movie they were about to see, but said, "These pictures are not occult, but they are psychic because everything that emanates from the human spirit or human brain is psychic. It is not supernatural; nothing is. It is preternatural in the sense that it is not known to our ordinary senses. It is the effect of the joining on the one hand of imagination, and on the other hand of some power of materialization. The imagination, I may say, comes from me-the materializing power from elsewhere." The reporter from the Times didn't know what to make of it and, as he said in his story, couldn't decide if Conan Doyle was "making merry" or "lifting the veil" and using some spiritual means to photograph dinosaurs from the past. The reporter concluded that these "monsters of the ancient world, or of the new world, which he [Conan Doyle] has discovered in the ether, were extraordinarily life-like. If fakes, they were masterpieces." Needless to say Conan Doyle stole the show that evening. Nobody talked about the magicians performances, only Conan Doyle's film. 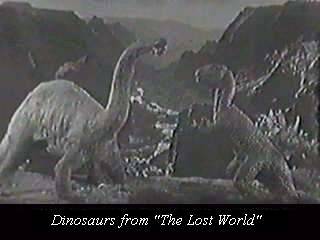 The next day, after the story appeared on page one, Conan Doyle exposed the trick explaining that the dinosaurs were test footage made by Willis O'Brien for the upcoming feature film, based on Conan Doyle's novel, The Lost World. O'Brien had lent the reel to Conan Doyle for the trick and at the same time gotten a triumphant test of his work, along with free publicity for the film.